That screen that divides the Abbey just beyond the choir stalls has the organ console on top of it. 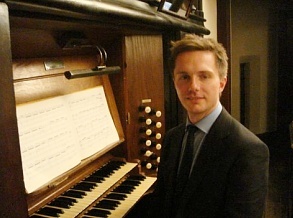 One of the organists who played at yesterday’s wedding tells us what his life is like. Paul Valéry once said that, when we look at the sea where it seems to join the sky, we’d think it was all vertical if we hadn’t learned otherwise. Ever since I heard that, I’ve been able to see it that way. It seems that I needed permission to see it as my eye would have naturally told me it was. In one of her novels, Patricia Highsmith has a character step into the square in front of St. Mark’s in Venice in the early morning while the city is quiet. He is struck by the impression that a space so figuratively resonant seems to have its own sound even when it is acoustically silent. We are taught what reactions we are supposed to have to various stimuli and, unless something happens to shake us out of our expectation, we are likely to obey that teaching. A phenomenon is supposed to have a certain effect on us — and not supposed to have others. In my own experience, there are two coequal ways for the past to be relived unexpectedly and most vividly. One, unsurprisingly, is musical reminiscence. A melody, or even a distinctive spacing of a chord or a timbre, can take me back to some past experience as only one other thing can: smell. Two days ago I encountered an odor that took me back to the age of five or six, and I’m absolutely certain that I have not smelled it since. I can date the odor that easily because it was one that I associate with, and only with, a warmer for baby bottles that my mother used when my younger brother was an infant. The specificity of the recollection was stunning, and it was stunning and exact in precisely the same way that musical memories can transport. The ancient Greeks (along with other cultures) were convinced that music can have not only psychological effects, but physiological ones as well. Many of us will recall musical thrills that, quite apart from any intentional therapeutic exercise of the kind envisaged by the Greeks, seemed to effect a chemical change in our bodies. I can recall one other kind of esthetic experience that powerful, and it is a visual one that I have known through architecture. It is of course a commonplace to attribute this kind of reaction to the grander manifestations of nature, but I acknowledge with mixed feelings that I have had it most memorably from the man-made. 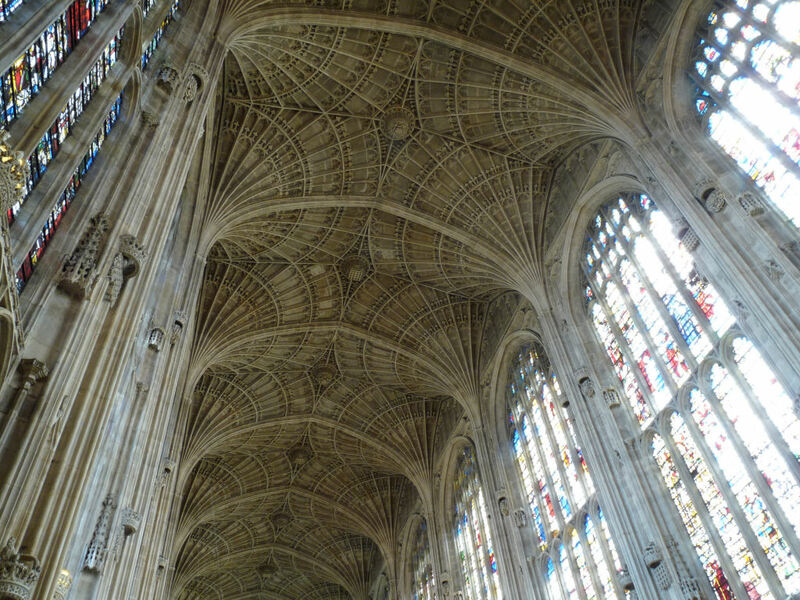 As I recall my first youthful entry into the chapel of King’s College, Cambridge, I’m certain that my body chemistry was affected. I can almost bring back the feeling in my imagination. 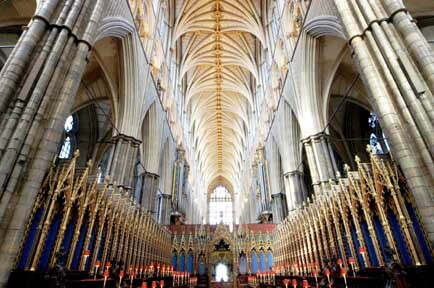 Queen Elizabeth I is said to have broken into tears when she first saw that interior. 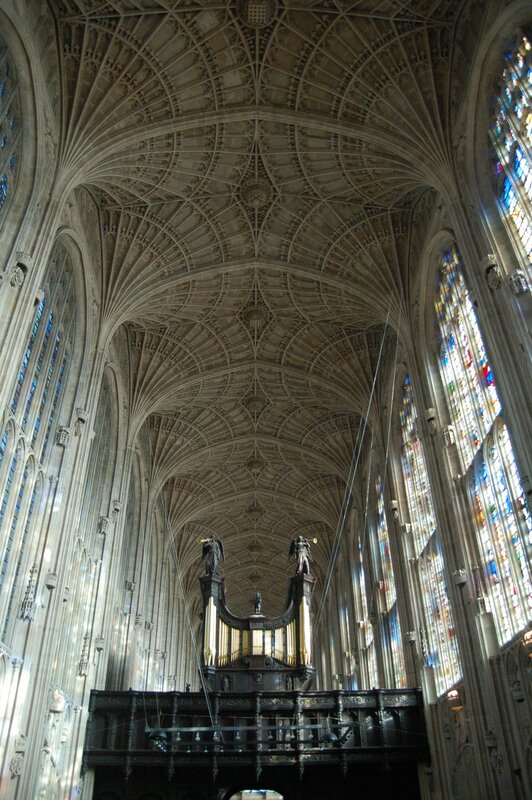 People assumed it was because she noted the intertwined initials of her parents in the tracery of the vaulting, but I wonder if she just may have had the same thrill that I experienced four hundred years later. The only other place that I am conscious of as having produced that effect on me is Jefferson’s famous quadrangle at the University of Virginia, the effects of which no photograph can approximate. I am convinced that it induces mental health in the susceptible. Facile claims of equivalences between arts and between senses are not worth much. Being attentive to one’s own experiences has its value, though. Valéry’s sanctioning of a counter-intellectual view of the horizon or a willingness to experience music, smell, and sights promiscuously — a simple willingness to let worthwhile greatness take us where it will — is a treasure of inestimable value. UPDATE: Speaking of powerful architecture, I’ve been pleased to have this blog pointed out to me.